With Change Jar, every debit card purchase is rounded up to the nearest dollar. 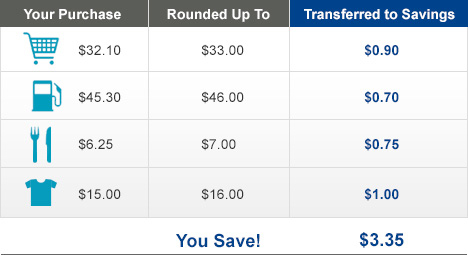 Each day, the difference from your purchases are transferred to your savings account. Just log in to Online Banking and select Change Jar Enrollment under the Services and Forms tab to start saving! *When you enroll in the Change Jar savings program, the amount of any one-time debit card purchase by you or an authorized card holder of your consumer Checking Account (business checking accounts and money market accounts are not eligible) will be rounded up to the next dollar. Only one time debit card purchases (PIN and signature-based transactions) are eligible for the program. The amount in excess of the purchase will be transferred to your designated Smart Savings or Regular Savings account. If the debit card purchase is an even dollar amount, $1.00 will be transferred. Each day’s purchases will be aggregated, debited from your checking account and posted to your designated savings account in a single transfer (described as ‘Change Jar’ transfer) at the end of the business day. If you do not have sufficient available funds in your checking account to make the Change Jar transfer, or if any transaction has overdrawn your Checking Account, the Change Jar transfer will be canceled for that day. If your debit card purchase is canceled or reversed after the Change Jar transfer has been made, the corresponding Change Jar transfer will not be reversed and will remain in the savings account. The Change Jar program may be altered or canceled at any time.